Approximately 300,000 patients in the United States have aortic stenosis (narrowing of the aortic heart valve), and about one third of these patients are too sick or too old to undergo surgical replacement. Under the leadership of NewYork-Presbyterian Hospital’s Division of Cardiothoracic Surgery, Transcatheter aortic valve replacement (TAVR) has been under study as a less invasive alternative for these patients. According to to the most recent results of the landmark PARTNER study, TAVR is as good as open surgery in terms of long-term survival. Craig R. Smith, MD, Principal Investigator of the PARTNER study, presented long-awaited results of cohort A to the American College of Cardiology 2011 Scientific Summit in New Orleans April 3, 2011. This arm of the study compared long-term outcomes of traditional aortic valve replacement with the catheter-based method of replacing the aortic valve. The study found the two methods equal in terms of long term survival. Patients who underwent transcatheter aortic valve replacement were at higher risk of stroke and vascular complications, while those undergoing open surgery were at greater risk of major bleeding. Results of the first phase of the PARTNER trial, cohort B, were presented in December 2010. This phase found that compared with medical therapy (including balloon valvuloplasty), patients who were too sick or too old for surgery had a 20% improvement in survival after one year with transcatheter aortic valve replacement. In addition to living longer, patients also felt much better and experienced fewer hospitalizations. At this time, transcatheter aortic valves are investigational devices in the US. Already approved and on the market in other countries, it is expected that TAVR may gain FDA approval as early as late 2011, at least for patients ineligible for surgery. 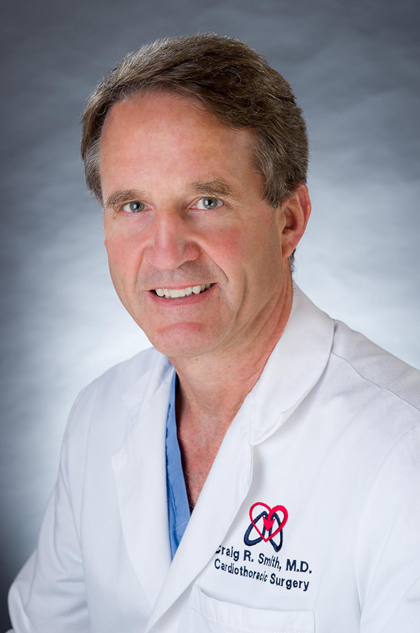 Dr. Smith is Chairman, Department of Surgery, Columbia University College of Physicians and Surgeons; Chief, Division of Cardiothoracic Surgery, NewYork-Presbyterian Hospital/Columbia University Medical Center; and Surgeon-in-Chief, NewYork-Presbyterian Hospital/Columbia University Medical Center/ Vivian and Seymour Milstein Family Heart Center. Other PARTNER investigators at NewYork-Presbyterian Hospital include Martin Leon, MD, Jeffrey Moses, MD, Susheel Kodali, MD, and Mathew Williams, MD.